The belt sander. A mean tool. 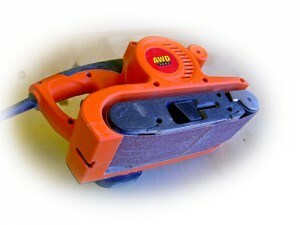 As I read from Wikipedia, belt sander races have already been organized. Plus there is an array of videos on YouTube where you can see people riding along a floor they actually intend to polish. Again, as is with power tools – they increase your power input. Sanding large areas is done (belt sander rotations per minute)/(hand movements per minute) times faster. This is at least a 100x difference. Only thing is that you can not get into tight spots with it. And you have to watch out with delicate places, since this thing really scrapes wood off fast, depending on the grit. We use it quite a lot. Not a must-have tool, but still, very good to have.